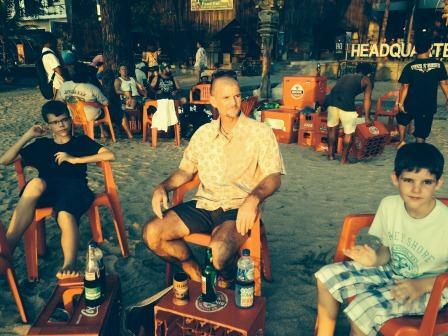 We have just returned from a brilliant mid-term break in Bali. There wan’t a lot of sitting around. It is amazing what you can pack into a week – especially if Shona has done the planning. 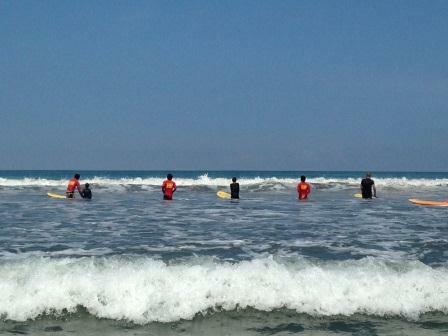 The boys had three mornings of surfing lessons at Kuta. Two and a half hours of instruction does not sound much but by the last morning I didn’t have the strength to push myself up on my board. On the last morning the surf was very strong and it was a real effort to get out beyond where the waves were breaking. However, great fun and very satisfying. We all progressed on to hard boards – but it’s a young person’s activity. The boys were incredible. Another day we were picked up early from our hotel and driven a couple of hours to the village of Munduk. This was basecamp for an adventure company who use an Indonesian built off-road vehicle called a Fin Komodo. It all started rather tamely. 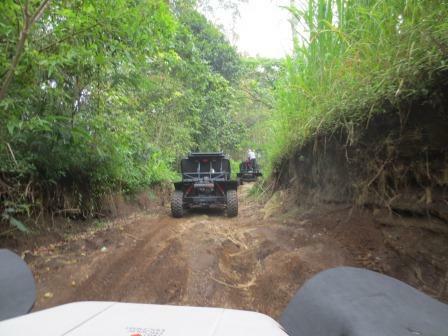 We got the hang of the two-stroke vehicles and set off down the hill on tarmac and then dirt roads. We stopped at a lake and paddled a log canoe for a while. Then it was back in the vehicles. A quick hand signal from the lead vehicle and we basically went off-road. These are before pictures. 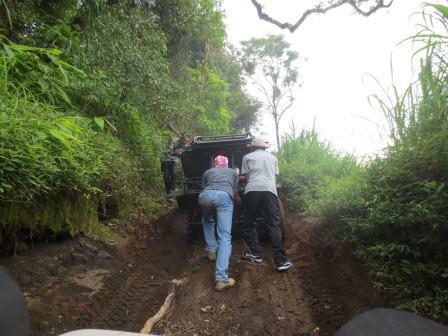 If we had not seen the first Komodo tackle the rocks and mud we would not have imagined the proposed ascent possible. Quite incredible vehicles. We stopped for a quick walk in a rainforest and then the heavens opened. We learned, if offered waterproof trousers before a walk in a rainforest during a thunderstorm – take them. We then spent the next hour in this thunderstorm driving back down the hill being soaked to the skin and beginning to chill quite alarmingly. The route became a muddy river in places and the boys were quite scared. Shona was magnificent the way she handled her vehicle. 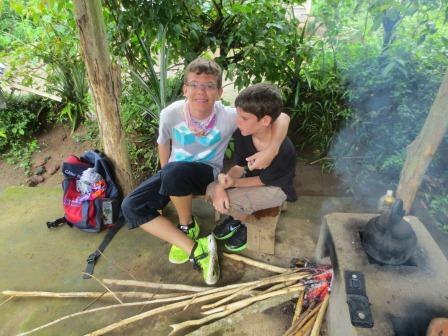 We stopped at a coffee farmer’s shack and the family very kindly lit the fire for Lucas who was blue with cold. They served us glasses of sweet coffee. It was only after we got introduced to the family cat that we realised what we were drinking. 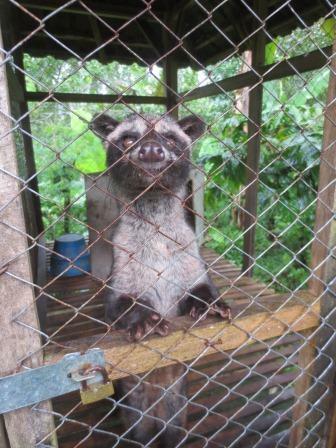 Coffee Luwak . Couldn’t taste the difference to be honest. Not many photographs from this memorable adventure, especially the scary bits. We arrived back at base camp for a hot shower, a change of clothes and a splendid lunch (Bintang never tasted so good). Despite the cold and rain and the fear we all agreed we would do this again. But, I would take something waterproof to store my iphone in. Mine’s still sitting in a bag of rice at home drying out – but not looking good. When Shona said she had booked a Balinese cookery class for us all on our last day it hadn’t set the heather on fire. After all the activity in the water and in the off-road vehicles it sounded a bit tame. However, I was pleasantly surprised. 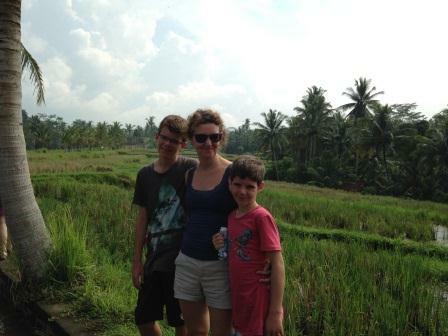 We drove to Ubud and met the lovely Ibu Puspa. 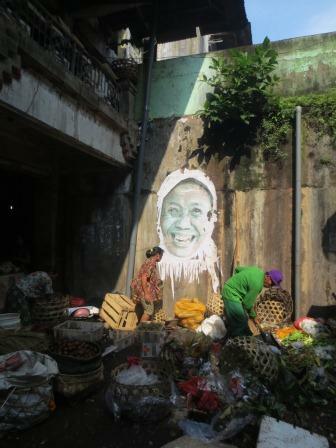 She gave us a tour of Ubud market explaining and naming all the local fruit and vegetables – and the herbs and spices used in Balinese cooking. We then drove to a rice field on the outskirts of town. 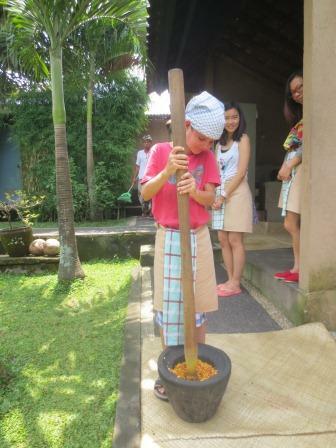 We found out about the rice growing process and land ownership from Ibu Puspa’s charming husband. Then it was back to the family home. This was a very slick but intimately enjoyable experience from start to finish. Everything was prepped for us. Very clean and hygienic. Vegetarians had been considered. 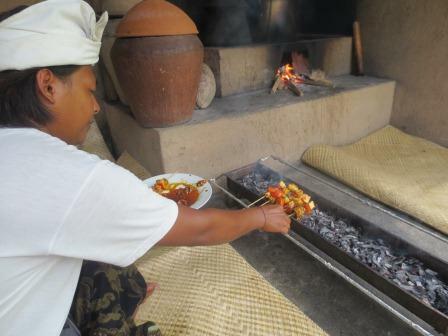 We chopped, crushed (in a traditional Balinese lesung) mixed and cooked for a few hours. Snake beans, lemongrass, coconut oil… nutmeg. 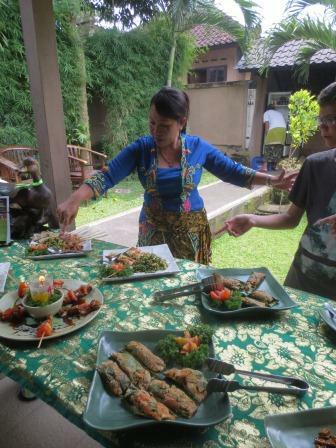 The result was a colourful banquet of Balinese food that tasted delicious. Clear mushroom and vegetable soup, yellow sauce, chicken sate and tuna in banana leaves. My favourite Indonesian dish, Gado Gado, except the Balinese mix all the ingredients together with the peanut sauce. Deep fried tempe in sweet soy sauce is about to be tried at home soon. We felt we had done enough to say we had played a part in the preparation and cooking. It was a bonus not having to do the washing up.